Recognizing the benefits of apprenticeship training, there is an obligation on the part of the Sheet Metal Industry to supply means for young persons to obtain the training and education to prepare them for the opportunities available in the industry. Therefore, the Sheet Metal Workers International Association, Local No. 20 and SMACNA Evansville have established trade training for apprentices in accordance with the recommendations of the Office of Apprenticeship and have prepared these standards for the administration of such trade training. This training will provide apprentices in the Sheet Metal Industry with opportunities to attain the skills required for true craftsmanship that will help not only to raise the level of workmanship in the trade, but also to develop the necessary background for good citizenship. 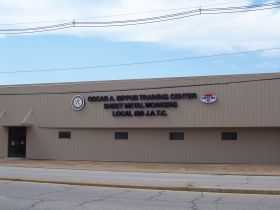 The Oscar A. Bippus Training Center is located on the westside of Evansville at 1301 West Franklin Street. A site visit is a good way for you to see, first-hand, our state-of-the-art facilities. Call (812) 424-2283 or email us to arrange a visit.